Lesson plans found here have been developed based on active student participation and the Georgia Performance Standards. The Carter Center’s work offers a valuable learning opportunity for your students. Efforts to wage peace, fight disease, and build hope around the world illustrate relevant principles of American Government and Civics, International Economics, United States and World History, and Geography. Lessons align with and support the Georgia Performance Standards for Social Studies. Each lesson incorporates material from current Carter Center programs. Visit the website. 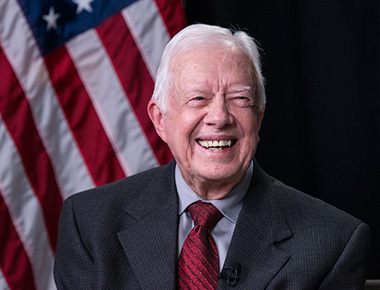 The President’s Travels is a geography-based curriculum guide to the Jimmy Carter Library & Museum experience. It uses the life and times of President Carter as a springboard to teach students about the world. All lessons make use of facsimiles of primary sources from our holdings: documents, reports, maps, photographs, letters, diaries, posters, artifacts, and recordings created by those who participated in the events of the past. Visit the website.